We are a family run business and have been established for over 30 years. We pride ourselves with an efficient fast and friendly service, along with competitive prices. Our experience and confidence in the products we supply ensure our customers return time and time again. 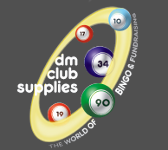 We supply an extensive range of products to suit all types of fundraising and club activities. Our customer database spans across the whole of the UK, amongst businesses such as; clubs and associations, hotels and public houses, oap clubs and community centres, schools and to the general public. As a large or small order specialist we guarantee every order is dealt with efficiently. We carry large stock levels and manufacture some of the products ourselves. We have a reliable delivery service and aim to deliver your order within 24-48 hours (UK mainland). Our website is constantly updated providing new products, sale or discounted lines as well as any clearance lines. Should you require any assistance then please do contact us via email or should you prefer a friendly voice then call within trading hours and we shall be happy to help. Any suggestions to help improve our website would be gratefully welcomed because we listen to our customers!